Prop collecting can be a very frustrating and financially draining hobby for fans of the Friday The 13th film franchise. Trying to figure out what is real and what is replicated is almost near impossible. There are people out there who are very good at determining if a prop was used during production, but even then there could still be some doubt if there is no official documentation, which even then experts will tell you could mean little. With that preface, today we found out about a very exciting prop from Friday The 13th: A New Beginning that has gone up for sale and fans should be at least aware it's out there for the taking. 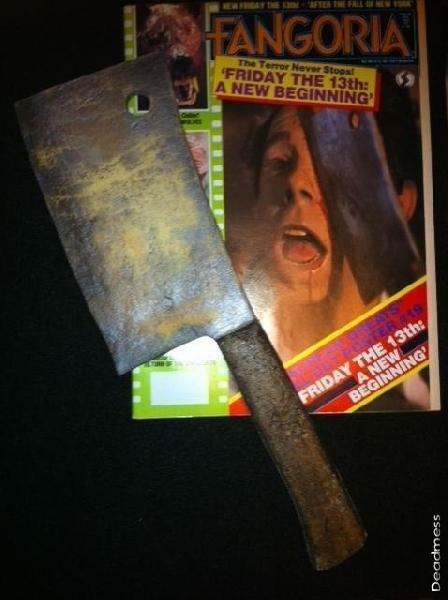 Just posted on eBay is a foam stunt cleaver from A New Beginning. At first glance of the auction photo below, fans should be understandably skeptical as these original items are very hard to find. However, we wrote a story about this same cleaver in January and the photo of that cleaver matches the one in the photo seen below, which was posted on eBay. At any rate, the cleaver is up for sale for a cool $1,200 and if you want props from the film franchise, here's your chance. Good luck to those who venture to buy this! Disclaimer: We are not film prop experts and cannot officially verify this prop as authentic. However, please contact the seller on the eBay page and do your research to make sure you are confident this is a legit item.